Hactivist collective Anonymous is holding rallies today in hundreds of cities worldwide to protest corporate greed and government corruption. Government websites in several nations have been hacked by the group to coincide with the events. While some locations managed to muster only a few dozen attendees, rallies in London and Washington, D.C. have seen hundreds turn out. 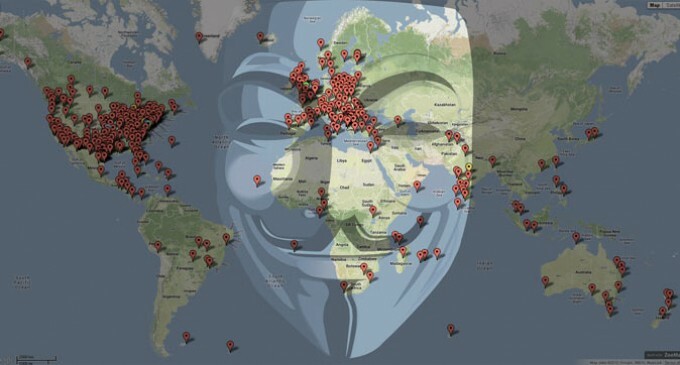 The global action on November 5 coincides with Guy Fawkes Day, which is celebrated by Britain with fireworks to remind of the botched attempt to blow up the Parliament in 1605. But the image of the notorious plotter has a new meaning for Anonymous and their supporters today. Cities in Japan, Australia, and New Zealand have already started their local events. Activists in Europe and US are expected to join soon. Event organizers have planned rallies and marches at 450 locations around the world, although the majority of the events have thus far attracted between several dozen people or a couple of hundred people.